M. Marey thinks that it is the inertia of its own mass that the cat uses to right itself. The torsion couple which produces the action of the muscles of the vertebra acts at first on the forelegs, which have a very small motion of inertia on account of the front feet being foreshortened and pressed against the neck. The hind legs, however, being stretched out and almost perpendicular to the axis of the body, possesses a moment of inertia which opposes motion in the opposite direction to that which the torsion couple tends to produce. In the second phase of the action, the attitude of the feet is reversed, and it is the inertia of the forepart that furnishes a fulcrum for the rotation of the rear. See the series of photos and read the whole account at “Photographs of a Falling Cat (1894)“; and see how the riddle was finally solved, 70 years later, Kane and Scher’s 1969 paper “A dynamical explanation of the falling cat phenomenon” (and in this Wikipedia article). As we adjust our attitudes, we might recall that it was on this date in 1993 that the first lab test was released in Arizona confirming a bee involved in a fatal on attack on a small dog at a Tucson home was an Africanized honey bee. 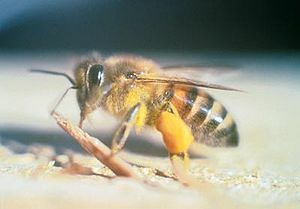 Because of their more intense defensive swarming behavior, such non-native bees earned the name “killer bee” in the media. Arizona was the second state to be invaded, less than three years after this species spread north into Texas from Mexico. Six years later, the bees claimed their first human victim in California: Virgil Foster, an 83-year-old bee-keeper, was mowing his lawn in Los Angeles County when he was stung at least 50 times by the highly-aggressive bees. Foster’s three hives had been taken over by wild Africanized honey bees. Originally hybridized in Brazil in the 1950s in attempt to increase honey production, the killer bees had migrated north through Central America.